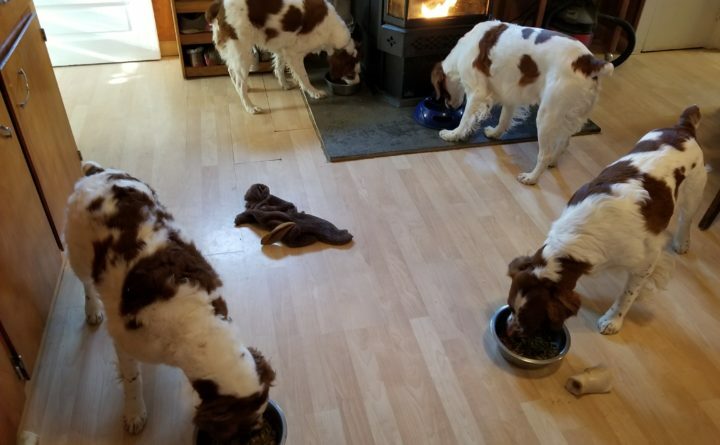 Brittany dogs (clockwise,from left) Thistle (2011-2018), Sassy, Bullet and Quincy eat their breakfast in March 2018 in the kitchen of their owner, Julie Harris of Hermon. Bullet's bowl is different because it is designed inside to slow down his eating. You may notice they each have cooked green beans in their food. When I was a child in the 1960s, feeding your dog seemed simple to me. You purchased the food that fit the family budget and supplemented with table scraps. But feeding the 21st century athletic bird dog is a different story. Nowadays, there are so many different theories about dog food ingredients and brands, it’s mind boggling. People tend to have strong feelings about what dog food they use and why, so even discussing it is difficult. I don’t pretend to know as much as I should about all of the theories or all of the different foods, but I do keep an eye on the overall health of my dogs. If their skin, coat, teeth, gums, stools, energy level and accuity all seem healthy, and they are not having medical issues because of their food, I tend to stick with one brand, although I may change formulas within that brand. For instance, my senior Brittany, Sassy, may need to be taken off kibble and put on a softer food because she is having teeth issues, so I will look at the canned version of what she’s eating to see if one translates to the other. Sassy, retired from hunting and flyball (dog relay racing), has different energy requirements than my other dogs, although she still needs good nutrition. If the canned food isn’t right for her, there are other options like a dehydrated dog food, which is made with human-grade ingredients and is powder reconstituted with water before feeding. The cost would be comparable to what I pay for her current food. Sassy also gets probiotics sprayed on her food to aid her digestion. The joys of aging, right Sassy? Truly, every dog has different needs that change through the years. At one point when I had four Brittanys, I had four different formulas of food in the house: Puppy formula for Quincy, prescription formula for liver disorders for Thistle (2011-2018), sensitive skin and stomach formula for Bullet, and weight management formula for Sassy. This is the first step in fixing breakfast for Julie Harris' three Brittany dogs Sassy, Bullet and Quincy in Hermon. The blue one belongs to Bullet, who without the specially designed bowl, would gulp his food too fast. Each dog's food is different in mix or formula, and their portions are determined by how much maintains a healthy weight for each dog. Now I feed Pro Plan Sport Active formula (26 percent protein, 16 percent fat) in winter and Pro Plan Sport Performance formula (30/20) during hunting season or intense training periods to Bullet and Quincy; and Pro Plan Bright Mind to 12-year-old Sassy. I throw a little bit of Bright Mind into 10-year-old Bullet’s bowl as well. 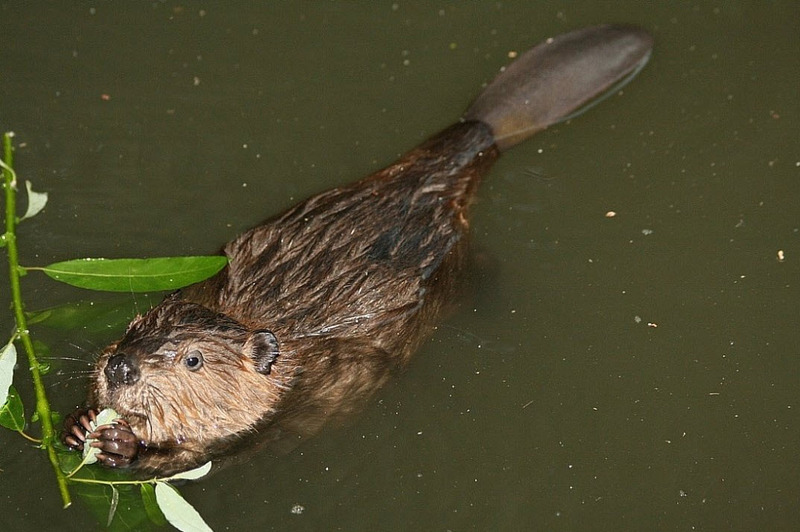 And all of them get water in their food, to slow down their eating, aid their digestion and to ensure they are consuming some liquids. For Thistle, I also tried homemade foods and raw diet — another fast-growing trend — as the veterinarians and I sought a food that she would eat but that would not be hard on her liver. There are not many manufactured foods that address this issue. Purina Pro Plan, which is one of several staple brands used by people who own, hunt and compete with bird dogs, is a higher-end formula than the Purina Dog Chow available in the grocery store. Some brands of higher-end formulas may be too pricey to feed regularly if you have multiple dogs, but there are plenty of quality foods on the market that are good for bird dogs. I prefer the food be manufactured in the United States at plants with good quality control and using ingredients that are sourced here, too. The first ingredient on the list must be real meat or fish, and the fat source must be of good quality, which basically are the same kinds of healthy fats humans consume such as fish oil. The protein to fat ratio must be appropriate for the time of year and activity of the dogs — a minimum of 30 percent protein to 20 percent fat during hunting and training seasons; lower, but still proportional, in off season. The food must have overall balanced nutrition for the dogs. Since my dogs don’t have an allergy to grains, I do not feed grain-free. My dogs also get some vegetables and select meat scraps. Cooked green beans make a great belly filler if a dog needs to be on a diet. Sassy can’t hear me call her name but she can hear a piece of lettuce land on the kitchen floor, and she loves to taste-test some of my salad ingredients. The two male dogs are less enthusiastic about salad, but will eat it. I don’t feed them foods such as onions and grapes that can be toxic to dogs. I also am picky about the dogs’ treats, which must be made of high quality or human-grade ingredients sourced and manufactured in the U.S. I often make treats for the dogs myself using ingredients such as pumpkin, peanut butter and whole grain flour. Other people in my dog circles are as loyal to their brands and formulas of dog food as I am to Pro Plan, also for defensible reasons. Some of it comes down to money, preference and availability. I order my dog food online and have it delivered to my doorstep. Otherwise, availability could be an issue for me. I don’t know if my approach is the best one, but it has worked for my dogs and me thus far. My best piece of advice is to know what you plan to do with your dog — hunting, dog sports or couch potato — and feed it according to its energy needs, always making sure it has balanced canine nutrition for its age.